The AR-15, the immediate ancestor and civilian equivalent to the military M16 and M4 rifles, is a tremendously popular weapon. One of the reasons for its enduring popularity with civilian and government operators alike is its tremendous flexibility and the virtually endless array of customization options it gives you. If you're ready to start thinking of your AR-15 as a mix-and-match rifle combining the best parts from multiple manufacturers, you need to spend plenty of time studying your terminology and make sure to find the right AR-15 Complete Upper Receiver For Sale from one of our trusted vendors. Understanding the upper receiver, one of the rifle's most vital components, is especially important. The upper receiver forms one half of the mechanical core of the AR-15 rifle. Together with the lower receiver, the upper receiver is responsible for most of the shooting, handling, and performance characteristics of the rifle. The two receivers are connected securely by a two-pin system that allows for quick conversions while still maintaining outstanding stability and reliability. Because the AR-15's upper receiver houses the bolt assembly and firing chamber of the rifle (and mounts the rifle's barrel), it has a lot to do with the overall shooting characteristics of the weapon. The modular nature of the rifle makes it easy to transform the AR-15 almost entirely by merely swapping one upper receiver assembly with another. AR-15 upper receivers for sale are at record low prices and now is the time to buy! Learn more about upper receiver assemblies vs. the stripped part below. If you're very new to the world of AR-15s, it's important that you don't confuse the upper and lower receivers when you're shopping and looking for assembly, maintenance, and modification directions. Fortunately, it's very difficult to mistake one receiver from the other if you're looking at a picture or have a few words of description to go with. The easiest way to tell the difference between the two parts has less to do with their location and everything to do about what they connect with. Obviously, the two receiver parts connect with each other. The lower receiver also connects to the grip, the stock and buffer tube, the trigger assembly, and the magazine. The upper receiver connects only to the barrel and the lower receiver. Important legal note: The AR-15's serial number is carried on the lower assembly. From a legal point of view, the lower assembly IS the rifle. This is not true of the upper receiver, and you don't need to have any special licenses or submit any personal information to purchase one. Like our guide to Cheap AR Uppers in the chart below are the top AR-15 Upper Receivers for 2018. Before you go any further, you need to understand two key pieces of upper receiver terminology: stripped upper receivers and upper receiver assemblies. Buying each of these will give you significantly different collections of parts, so you don't want to get confused. The stripped receiver is fairly self-explanatory. It's just the receiver itself, without any of the parts that attach to it. This is the way to go if you're completing a fully customized AR-15 build and have your own ideas about what barrel, bolt, and fittings you want to use. The upper receiver assembly is a bit less fully defined. When some sellers talk about an assembly, they're referring to a receiver with a dust cover and forward assist installed. Others include the charging handle, hand guard, and even the barrel. Sometimes the assembly includes everything except the barrel. Some assemblies come with a bolt and bolt carrier, but many do not. Review the contents of an assembly carefully before purchasing it or using it to make sure you're getting all of the parts you need! AR-15 upper receivers come in a few different styles that will dictate a lot of your other parts choices. The original A1 style receiver has an integrated carrying handle on the top. The A2 style is similar, but it has a much more robust rear sight assembly. The A3 and A4 style receivers omit the handle and are therefore often called "flat tops." Most (but not all) A3 and A4 receivers come with integrated Picatinny rails for mounting accessories. The difference between A3 and A4 receivers is pretty subtle; it comes down to how the feed ramps are designed. A4 receivers have longer feed ramps for smoother loading and are designed to work with barrels and barrel extensions built to the latest M4 military spec. The performance differences between the two upper receivers are very small, but it is important to match your receiver to your barrel. This does what it says. Pulling the handle racks the bolt carrier group, loads a round into the chamber, and prepares the rifle for firing. The charging handle is also used to eject rounds without firing and clear the rifle. This is one of the AR-15's most military features. It's a purpose-built emergency fix for when the bolt won't seal properly due to dust, dirt, or damage in a combat situation. If you keep your AR-15 clean and use quality ammunition, you'll probably never need to use the forward assist. A lot of civilian receivers omit the forward assist for the sake of economy, convenience, and lighter weight. The key moving part of your AR-15. Surprisingly, this is also one of the most variable parts of a "complete" upper receiver assembly. Many manufacturers do not include one with their assemblies; review the details of any assembly carefully to check for the bolt and bolt carrier group (BCG). This four-piece assembly is basically just a threaded connector. It's responsible for linking the upper receiver to the handguard and barrel, though, so it's fairly important. The "business end" of the rifle. AR-15 barrels come in a huge range of different styles. The most important feature is probably the barrel length, as the other parts listed below have to be sized appropriately to fit the length. The most common lengths are 20 inches (AKA "rifle") and 16 inches (AKA "carbine"). The barrel also includes a separate extension that has feed ramps in it. Note that buying and installing a barrel shorter than 16 inches is tightly regulated in many regions, and may require you to have a lower receiver that's registered and licensed differently. Another very self-explanatory part. The handguard shrouds the barrel and gas tube and gives you a secure place to hold the rifle. Sometimes called a forearm. Very few commercial handguards copy the solid triangular handguard which was featured in the original design of the M-16 and AR-15. Most modern handguards have open ports to reduce their weight and improve airflow around the barrel. 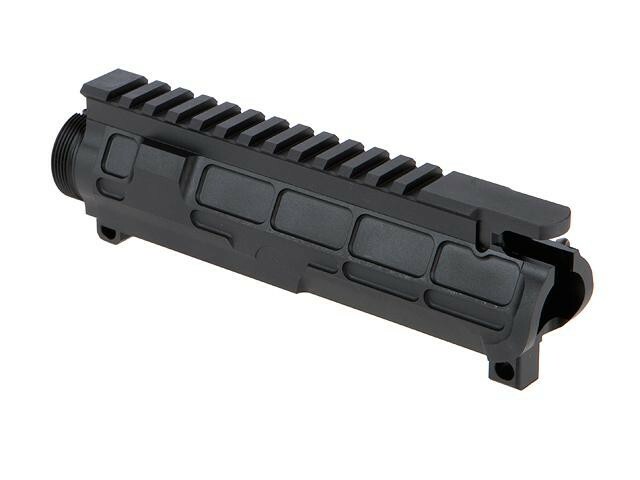 The most popular types are called "4-rail" handguards because they have accessory mounting rails on the top, bottom, and sides. These are the operating parts of the rifle's semi-automatic / automatic operation. The gas block is sometimes fully integrated into the handguard and sometimes separate. An assembly that's designed to mount fixed front sights will typically have them positioned on the gas block. The gas tube, which actually transmits the recoil force back to the bolt to cycle the rifle, is basically just a carefully-machined rod. This assembly screws onto the end of the muzzle. There are tons of different designs which can reduce recoil and cut down on muzzle flash. Because of the huge range of configurations that are possible and the minimal amount of regulation imposed on the industry, a lot of different companies have gotten into the business of making and selling AR-15 uppers. This can make it awfully confusing to purchase one! While every individual receiver and receiver assembly has its strengths and weaknesses, over time certain brands earn a reputation for quality and reliability. These manufacturers are widely acclaimed for delivering premium receivers. Their products are going to cost a little more, but they'll also last longer and give you the fewest possible number of issues: Colt, Larue, Lewis, Noveske, LWRC, Daniel Defense, and Bravo Company. If you're looking to save money, there are other brands that have developed a reputation for delivering a great amount of value without a lot of frills. Accessories and premium features may be missing, but these receiver manufacturers get the job done for less: Bushmaster, Stag, Olympic, Delton, Palmetto State Armory, and Rock River Arms. Finally, there are many manufacturers that aim for a middle ground between reliability and affordability. Receivers made by these companies can deliver excellent value. You should carefully review and test their upper receivers if you intend to use them in weapons designed for combat, home defense, and other critical applications, though. Sample brands: Ruger, Sig Sauer, Smith & Wesson, Rainier Arms, FNH, Anderson, Aero Precision. Note that a brand is no guarantee of quality and performance. Before you buy any upper receiver or upper receiver assembly, research it thoroughly. Check the full parts list of assemblies to ensure you're getting everything you need. Read reviews from past customers to get an idea of a specific model's performance. You'll also find extensive discussions on the value of most upper receiver models in forums dedicated to AR-15 assembly. Without getting down into individual models and assemblies, this guide should get you pretty well prepared to start shopping for AR-15 upper receivers. It's by no means comprehensive; literally thousands of informative words have been written about every part of the AR-15 right down to the most humble pieces of the weapon. Learn everything you can about the upper receiver in general and the specific models you want to purchase before you invest your hard-earned money in this key AR-15 component.